March 27, 2012, Washington, DC: What's more nomadic and neighborly than a tight-knit community that floats? Judging from the camaraderie among residents who live on their boats at Gangplank Marina in Southwest Washington, DC, not much. The liveaboard community here is the largest on the East Coast, and it is also a community on the brink of change, smack dab in the middle of plans to develop this section of the city's waterfront. 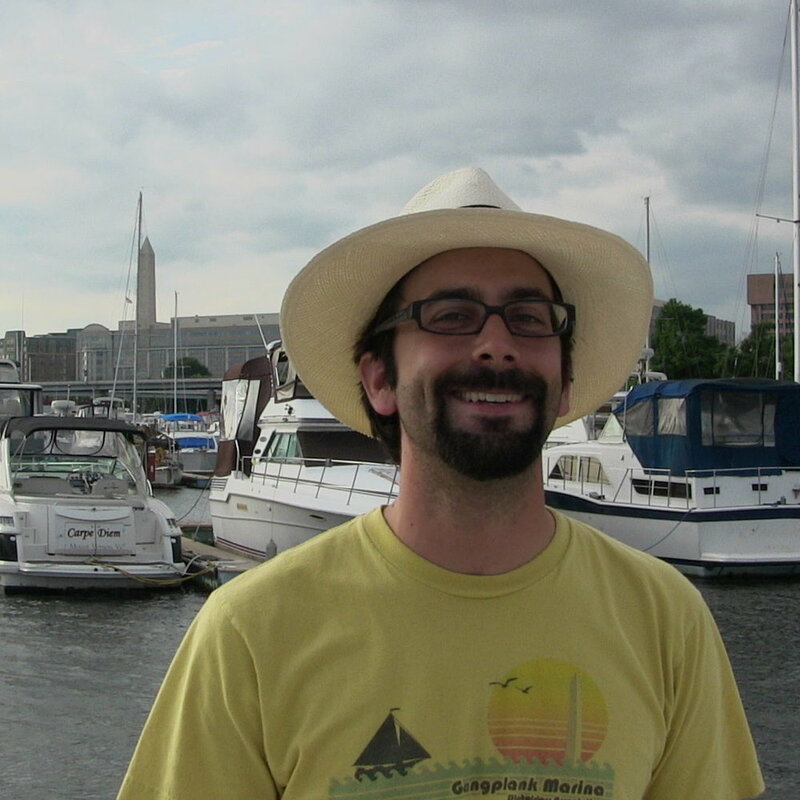 Gangplank Slipholder Association president Jason Kopp is among the community's most vocal advocates for the vitality of this place and he agreed to tell us more about his floating neighborhood. What's the makeup of the liveaboard community at Gangplank Marina? It's really diverse in a lot of ways, especially for DC, because beyond just floating on the water, there's a different kind of culture that exists in the marina. When you come to the marina, the first question someone's likely to ask you is, "Do you live in the marina? What boat do you live on?" We all know that even if we have nothing else in common, we share this love of being on the water. It's a very different way to start a conversation than you might have if you were in another part of the city, where "What do you do? Where do you work?" might be the starting point. It's not that people want to hide it, it's just that it doesn't normally come up. It's not the first thing that we're focusing on in our community. In terms of the actual composition of the marina, we have a lot of single people as one might expect, we have a number of couples, and then we have some families too. We even have a newborn now. There aren't any toddlers living here right now, but there are some people who are raising their older children here, and most of these kids spent their childhood living here in the marina, so this is the neighborhood they grew up in. You can find postal workers, professors, federal government employees, boat contractors, congressional chiefs of staff, filmmakers, doctors, baristas, and attorneys. Everyone you can imagine you might find somewhere in DC, they're probably represented somewhere in the marina. Tell us about your community gatherings, traditions and rituals? In nice weather, we have the event barge over there. On Thursday evenings, we generally have our grill-out/happy hours. It's potluck; we grill up whatever anyone brings. We also have our Sunday morning Captain's Coffees year round. We gather on Sunday mornings to share coffee and swap stories about the latest news in the marina or share advice on how to fix a leaky hatch or stubborn engine. For someone new to the marina, these are great ways to get to know their neighbors. The Port of Washington Yacht Club also has a lot of traditions that are rooted in the boating culture. The POWYC has a yearly calendar of events, which includes the Blessing of the Fleet every spring. We're trying to make some of those events more accessible for the broader neighborhood to share the experience. This year, we're going to make sure we have a good viewing space for the Blessing of the Fleet for anyone who's not out here on a boat. We're hoping we can use 7th St. Landing to have space for our neighbors to participate in the ceremony. That's just one example. We had the Boat Home Tour last year. Next weekend we have our Chili Cook-Off that's also open to the community. We're hosting it at St. Augustines in the basement. It’s a fun way to build community and get to better know your neighbors. Then there's the Parade of Lights every December. That's actually traditionally organized by the Alexandria waterfront, but we’re trying to get more programming here and get more people to participate along DC’s waterfronts. This year there was music and hot chocolate and s'mores; we had a really nice crowd from all over the neighborhood watching the boats go by. Something else that’s a ritual for us a community is that we have these shared docks that we walk up and down to get to our slips. I can’t think of anything that would have a more positive effect on a community than to force people to walk by each other every single day and to have these moments to interact with each other. You get this regular contact with people even if you don’t have a lot of free time to spend with them every day. It’s a really nice way to have spontaneous social gatherings. Where else have you lived? I lived in San Salvador, El Salvador for a year after I finished undergrad. I worked as a volunteer for a non-profit focused on sustainable development, specifically in rural areas. When I came back to the States, I volunteered as a paralegal with the Northwest Justice Project out in Yakima, Washington. It was my first experience with the Pacific Northwest -- I'd grown up in Michigan -- and I absolutely fell in love. I tell people from Washington State that I spent a year in Yakima and I loved it and they think I'm crazy, especially if they're from Seattle. Later, I moved out to Monterey, Calif., because they have a really great language graduate program out there. When I graduated, I got a job offer here in DC. What did you initially think of DC? I didn't know how to feel about it because one of my favorite things about living in Monterey was that it was right by the ocean. It was beautiful. I could just run out and surf whenever I wanted. I could jump in a kayak and see sea otters, harbor seals and sea lions. I had spent a summer in DC and I was skeptical I could find anything like that, where it would be so easy to connect with nature. I was familiar with a few green spaces. I knew about Rock Creek, I had gone hiking out in Shenandoah -- but I just thought, I don't know how I'll fit in. I see a lot of cement. So how did you find home? I thought, "If I'm gonna live there, I need to find a place that's near a natural area." Also, while volunteering, I'd had really positive experiences with what I would call selecting an intentional community -- you know, a group of people that decide to live in a place because they enjoy it and because they enjoy the people around them. So I thought, "When I move to DC, I really want to make sure that I select an area that has a really good sense of community." I started looking for ads for housing in the paper and I was intrigued by Southwest. It was somewhat more affordable than other areas of DC, liked how it was near the Washington Channel, and I got a sense that residents there were vested in the community. I liked Arena Stage and I knew they were going to open back up down here. National's Stadium was nearly finished in Navy Yard. So I was kind of looking around the area in general and then I saw an ad in the City Paper that said, "Great condo alternative. Buy a houseboat." I did not grow up on boats. I grew up a little bit around the water, not on a lake, but I swam and kayaked and canoed a lot as a kid. But I didn't know a whole lot about boats and wasn't too mechanically inclined, so the boat idea definitely was a little bit of intimidating at first. But I decided to contact the seller from the ad and came and looked around the boat and thought it was great. I didn't even know there was a marina in Southwest DC. It was my first time at Gangplank and I thought it was a beautiful area. I hung out on the deck that evening and she said, 'Come out and watch how the sun sets out here, it's beautiful" -- you know, trying to sell me the boat -- and it was. It was absolutely spectacular. And then a neighbor came by in his dinghy. He didn't know me and he didn't know I was there to buy the boat, but he said, "Hey we're heading over to this Docktobterfest party happening in the marina. If you want a ride, just jump in." I couldn't pass it up, so I ended up hanging out with a bunch of people I'd never met before. It was this wonderful night at the party and I just thought immediately after that, "I've got to move out here. I don't know how exactly I'm gonna make it happen. I've got to learn a little bit more about boats, I have to make an informed buying decision, I have to convince my family I'm not crazy, but I'm gonna do it." About two months later, I moved here and I have been so happy with that decision. I've never regretted it. How quickly did you adjust to living on the water? I moved in in November 2007, right before the winter. It was a little scary because I didn't know exactly what I was getting myself into. The smallest maintenance issues could make me terrified by boat was gonna sink. I'd find a little water somewhere and I'd think, "Oh my God, my boat's leaking, it's gonna sink." However, the sense of community was tremendous and my neighbors made the transition very manageable. Our Captain's Coffees provided a wonderful opportunity to meet neighbors and learn about proper boat care. I could say things like, "Yeah, I'm having this issue. I don't know how to handle this." There are so many people around the marina that just love boats and love working on boats that I never had a shortage of information. It made the adjustment a lot less intimidating and it made it a really enjoyable place to come home to. What does the planned redevelopment of the area mean for the community at Gangplank? Here is my best attempt to be concise about that. Overall, we’re very supportive of The Wharf project. DC as a city could benefit hugely from better utilized waterfronts. If you look up and down both sides of the Anacostia, to east of the river, down in Southeast, and along the Washington Channel in Southwest, we have rivers that we haven't cared for and we have communities that we haven't necessarily taken care of and invested in. So I think getting a foothold to start to correct those issues, getting people to focus on the water and appreciate it, could be huge. It could really start to transform the city. How many people do you know who visit DC thinking it’s a port city? A lot of people don’t even know there’s a fish market down here, or a liveaboard community, or that there are boating communities up and down the Anacostia. I’m sure a lot of people are not familiar with Kenilworth Acquatic Gardens and the port history of the District, and that has a lot to do with why DC was selected as the nation's capital in the first place. So overall, we are very supportive and I really truly believe that The Wharf can help spur waterfront development that may be extremely beneficial to the city. We’re in an interesting position at Gangplank because we’re the only community that actually lives right in the area that’s being developed. There’s a lot of people that will be affected in other ways who live in Southwest, but we live right in the middle of the area to be developed and the impact of construction will be huge. Some of us will need to move and keeping the community intact during a multi-year buildout will be a challenge. We’re appreciative that the developers have been doing a good job communicating with us and meeting with us on a regular basis to try to understand our concerns. We’re also trying to work with them very closely to get people excited about the area, organizing and promoting events along the waterfront. We're playing a big role in planning the Southwest Waterfront Fireworks Festival on April 7, and we try to use the great interim spaces the developer has created, like 7th St. Landing, to help put on events like the Boat Home Tour. While we're very excited about The Wharf plan, we also realize there is still work to be done in order to guarantee that our community will survive the transition. We're happy the developers have made a general commitment to the liveaboard community at Gangplank Marina and started work on a transition plan to allow slipholders to remain in the Washington Channel throughout the redevelopment. However, we believe additional written clarification on both management of liveaboard status and a transition plan are necessary before we can fully support the Stage II PUD. We think the developers are really getting it right when it comes to focusing design attention on the water. We hope they'll also focus on the importance of preserving the Gangplank Marina community, which we believe is key to ensuring the vibrant, active waterfront Hoffman-Madison Waterfront envisions. How do people here get involved? The Gangplank Slipholders Association is the main community organization in the marina. We try to act as an umbrella for all the amazing groups that work, live and recreate here. In addition to the liveaboards, workaboards and recreational boaters in the marina, DC Sail, DC Dragon Boat Club, National Maritime Heritage Foundation, Living Classrooms, American River Taxi, and many others also call Gangplank home. With so many active organizations, it's easy to get involved. And what makes this neighborhood awesome is that, almost anywhere you look, you can find people who are willing to help with anything that will benefit the larger community. Gangplankers love living here, love the local waterways, and are always excited to have fun. Last year for the Boat Home Tour, one of our residents decided she was just going to make the tour happen. That was a great event and so well executed -- it's fantastic to have people around the marina like that. There are moments when people will get busy and won't be volunteering around the marina for several months, and then you'll have another moment where that same person does something like the Boat Home Tour and you're just blown away. I don't know if it has to do with the type of people who move to the marina or something about being on the water, but it's such a fluid community and that's part of what makes it so fun. Be sure to come down and check out the pink lights on our boats for the Southwest Waterfront Fireworks Festival on April 7. It's another example of how excitement spreads throughout the marina to create something beautiful we can share with the neighborhood. Does the Gangplank community do work to protect the rivers? Environmental issues are huge with us. It sounds cliche, but the river is our backyard. We live in the Channel, we boat up and down the Anacostia and the Potomac, and we care about the rivers a lot. I'm pretty sure every person in this marina wishes we could just take a boat or a kayak or a dinghy out and anchor somewhere and jump in the water for a swim. We wish we could go fishing and not have any concerns with the fish. It's sad when you see trash floating around and you see wildlife eating the trash or getting stuck in it. There are so many awesome organizations out here doing great work -- like the Anacostia Watershed Society, Earth Conservation Corps, the Alice Ferguson Foundation -- so we're doing our best to promote those groups, to help out when those groups have volunteer activities, and to raise money for them when we can with things like the Boat Home Tour. We also have a standing environmental committee to help us continually focus on ways to care for our local waterways. Our GPSA vice president and the environmental committee chair Eve Bratman started a clamming project. She organized a group that headed over to Fort Foote to find clams. We'd go dig up clams and then we made our own little clam boxes, the idea being that bivalves can filter the water. We realized we weren't going to clean up the entire Potomac, but it was a fun way to learn more about our local environment and to take on an experiment to see how a small effort like this could work. We also organize a cleanup site for the Alice Ferguson Foundation Potomac Watershed Cleanup. We're going to have a site out here in Southwest again on April 14. How does the community at Gangplank Marina fit into the broader Southwest neighborhood? We believe we're vested in Southwest and that it is our community. We love the area. It seems like there's always something exciting happening, whether it's Arena Stage, Jazz or Blues at Westminster, the Southwest Arts Festival, the Southwest Waterfront Fireworks Festival, or the farmers market, music and exercise programs at 7th St. Landing. We see a lot of potential for this area as it continues to change --and it has an incredible history. Southwest is full of hidden gems and wonderful people. We feel like we are just like anyone else that might show up at an ANC meeting from the neighborhood, except that our homes float. We recognize that many people are fascinated by that fact, so we do our best to interact with our neighbors on a regular basis and provide opportunities for them to get to know us. We share many of the same concerns as our neighbors who live on land -- we want to preserve what is beautiful about our neighborhood as we continue to grow. We also want to provide opportunities for residents to identify with and take ownership of DC's waterfronts. We believe that if DC residents rediscover their rivers and see the Washington Channel is part of their waterfront, that sentiment will go a long way towards helping heal our local waterways.